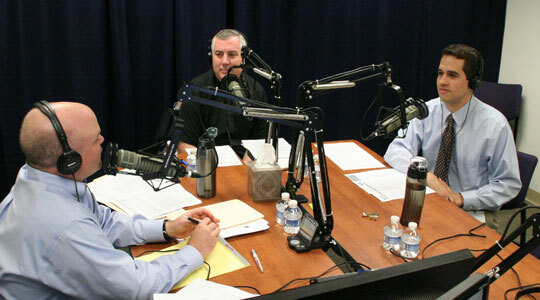 Summary of today’s show: Josh Phelps talks with Scot and Fr. Mark about the work of pastoral planning, part of which is looking at the reasons Catholics give for not attending Sunday Mass every week. Also, our hosts and guest look at this Sunday’s Mass readings and how they relate to our need to respond to God’s Word by being part of our parish community. 1st segment: Scot welcomed Fr. Mark back to the show. Today’s show will discuss why people make the decision not to attend Mass. Fr. Mark wondered if when people go on vacation they will bother to go to MassTimes.org to find a local Mass. Scot welcomed Joshua Phelps to the show. He is a graduate of Boston College and worked previously as a Pastoral Associate at St. Patrick, Watertown before coming to work at the Archdiocese in the Pastoral Planning office. He and his wife have been married for five years and they have two children. A couple of years ago, their family was featured in an episode of the CatholicTV program “House+Home”. Josh said it’s a surreal experience for people come up to them and say they saw them on TV. Josh worked previously in retail forecasting and moved to pastoral planning. Pastoral planning is a catch-all for helping parishes be the best they can be. It’s their hope to help parishes work toward the mission of Christ. When an initiative like Catholics Come Home starts, while it’s a project mainly of Faith Formation and Evangelization, it’s near and dear to Pastoral Planning because they see the statistics regarding the Church in Boston. They see both the downward trends in some parishes and upward trends in others and then they dig down to find out why the differences are there. Josh said leadership, mission, and vision are incredibly important. Parishes that are seeing increases are those that take Sunday Eucharist very seriously and where people see the Eucharist as a very important part of their lives throughout the week. The mission is to live out the Gospel of Christ and build the kingdom of God in that parish. Parishes that take it seriously are the ones that see growth. Josh recently helped two parishes in Wayland to complete a merger. The parishes themselves initiated the merger between St. Ann and St. Zepherin to form one faith community as Good Shepherd Parish. It was a lot of work by a lot of people. As a result of the merge, people now say to their neighbors, “I didn’t know you were Catholic,” because went to different parishes. Fr. Mark said the merger isn’t complete, but goes on for years. While being in the same town, they are very different communities and it needs leadership like that of the pastor, Fr. Laughlin, to facilitate that. Even though they were so different, they were able to come together in a process that both could embrace through proper planning and setting a reasonable timetable. Scot said parishes with very different cultures can come together fully. As the archdiocese continues to look at pastoral planning, this model will have great import for the future. Josh said every parish starts by asking what is in the best interest of the parish to move forward and thrive. In Wayland, they decided it was to come together as one parish and one community. Across the archdiocese, people are realizing the same thing. Fr. Mark said that in some places they maintain two parishes with one pastor, but it’s easier like here where it’s just one pastor, one parish council, one pool of money for the budget and so on. Fr. Mark said he’s most of those comments at one time or another in his priesthood. Scot said Kelly says the problem with the Mass is “me” and if we approach the Mass each Sunday with asking God to show us one new thing about how to improve ourselves, it would change everything. Josh said that instead people want to change the user experience as if that would make a difference. Scot said our culture is all about seeking entertainment and we’re used to being spectators, but if we want to get the most out of Mass, we need to be an engaged participant by preparing: Reading the Sunday readings ahead of time; keeping a journal to Mass to write down one thing to make myself a better version of me and then to meditate on that throughout the week. Scot said he’s never been let down when praying for God to help him to deepen his faith. 5. Don’t feel welcome because of their state in life, e.g. divorce or they have small kids. But the most important reason, 32% say, they don’t feel it’s important to go to Mass to be a good Catholic. Fr. Mark said people start by forgiving themselves and stop going to Confession. Then they decide they can pray on their own and don’t need to follow rules that tell them where to pray. Scot said his brother, Fr. Roger Landry, that people who say they are spiritual, but not religious, really mean that they want God on their own terms, whereas a faithful Catholic would say that I want to love God on Jesus’ terms. Josh said when he prays at home, he’s praying by himself or with his wife and children, but when he’s at Mass he’s praying with the entire 1-billion person Church and even more if you include the saints in heaven. The Mass is an incredibly important part of our spiritual life. It is spiritual food for our souls. Fr. Mark said our community is less without the full community. The person not only needs the community, but the community needs them. The Church needs the full participation of the community, because without it we are less. Much of our culture is focused on individualism. We don’t think of ourselves as part of a community. Scot said God created us to be part of a family and that’s what each parish strives to be. Eucharist means “thanksgiving” and Scot’s been thinking about how that relates to the American holiday. People will travel across the country on the third Thursday of November, even if they know it won’t be the most fun or if it’s a big hassle, but there’s a sense that we’re made to be with our family on that day. Our heavenly Father is like our parents who say all that matters is that the whole family is together on that. Scot said Cardinal Seán is writing a pastoral letter on Sunday Mass attendance and he will write about how much of the factors are within our control. Josh said the Australian study shows that it’s no one fact that pushes people out the doors of the Church. In many cases, it just happened over the course of a long period of time. Fr. Mark said he’s been impressed by the people who come on the program who see a need in their parishes and participated and made it better rather than just leaving because it wasn’t what they wanted at first. Scot said John Paul II described love, not as a feeling, but as a self-gift. Pope Benedict’s first encyclical was the God is love. God loved us first and how do we love him back? Not through a feeling, but through an act of the will of a self-gift. Even if we’re not active in a ministry, we can give of ourselves on a Sunday morning by witnessing to our community and neighborhood that this is a priority. for one thing, it’s a different experience sitting in church that’s packed full of people rather than a mostly empty one. Every time we make a choice to go to Mass, it makes a difference to everyone else in that church. Scot said another reason in the study was the Sundays are not distinct any more. Businesses are open, people have to work, people have to do chores, kids’ sports are scheduled on Sunday morning. That makes it even more important for the Catholic to show neighbors by our witness that Mass is our priority. Those actions will make someone notice. Archbishop Dolan of New York recently wrote about threats to Sunday Mass. He said in recent years communication technologies have made it easier for us to be distracted and make church just another in a range of options on the weekend. Scot suggested that perhaps as a response it would be fruitful for Catholics to turn off TVs and computers and other distracting devices on Sunday. In his letter, Archbishop Dolan then responded to a lot of the same objections found in the Australian study. “Sunday is our only free time together.” (Great, what better way to spend that time than by praying together at Mass). “I pray my own way.” (Nice idea. But, odds are, you don’t). “The sermon is boring.” (You may have a point). And the simple fact remains: the Eucharist is the most beautiful, powerful prayer that we have. To miss it is to miss Jesus — His Word, His people, His presence, His Body and Blood. 2nd segment: Now, as we do every week, we look forward to this coming Sunday’s Mass readings to help us prepare to celebrate together. Josh said he sees two important aspects of the readings: The seed that is sown, which is the Word of God. The Word is perfect. And then the soil. A farmer would say there’s only so much you can do with the rocky ground. He thinks of his own life and how he tries to live the Word of God superficially and he then has to uproot himself and change his life and move to more fertile ground in his life. Fr. Mark said the key is the roots. With regard to today’s topic, we need an environment that isn’t just a quick high, but creates deep spiritual roots. He related the story of Orpheus, whose music could seduce anyone, but when he stopped playing the people were left worse off, pining away for the music. He said the true test of a teen or college ministry is whether the young people can move on from the interesting, high energy Masses aimed at them and go to a regular Mass and remain fully engaged. Scot said the parable speaks directly to today’s topic. The culture is hardened against the Word of God. When people don’t understand a Church teaching, they just dismiss it rather than wonder if there might be some truth in that. He said that if we’re reaching out to people to help plant the seed, but there needs to be reciprocity from that person. Even if they don’t respond right away, we don’t stop trying and letting the Holy Spirit work. Josh points out that the sower is actively sowing seeds, not sitting back passively. A parish should not sit back and just say that the doors are open if anyone is interested. A parish should be mission-oriented and entrepreneurial. Fr. Mark said the deep roots he spoke about are built by spending time. We have a responsibility to bear fruit. It’s not just about what can I get, but what can I give.